It is very difficult for a weekly column to write on a topic in instalments as it has to comment on current topics as well. Recently it has become a common phenomenon to observe people coming to the roads and blocking them, setting fire to tyres and making mayhem against some or other police action. Last week at Dematagoda, people from what is known as T 20 Watte, nothing to do with cricket, blocked the Baseline Road apparently over taking some people into custody by the police. The Police claim that those who have been taken into custody are “bad boys” and an inquiry is being held. In any event twenty three have been released on bail, and the police has informed the whereabouts of the others. It is true that the Police has had not a clean track record but people protesting against is a new experience that has to be looked into by the police itself. 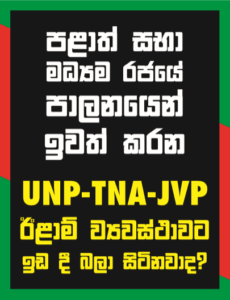 It is a well known fact that a leading member of the Peratugamee Samajavadee Pakshaya (PSP) who had been a convenor of the illegal Inter University Student Federation was among the protesting people at Dematagoda. The PSP has no mass base island wide and has no strength to stage another 1971 or a 1987-90. It is being used by the westerners for a limited purpose as we have said on few occasions and they have been assigned the task of staging this type of demonstrations so that the police would retaliate probably with the support of the armed forces, and create “human rights violation cases”, for various human rights organisations here and abroad to protest against the government leading to economic sanctions and even perhaps to a NATO attack in the name of R2P and internationalism. Dr. Manmohan Singh wants Sri Lanka to devolve power to the Tamils. Ha!